Europe during the Middle Ages. You are a merchant, owner of important markets in 6 majestic cities of Europe. At the heart of this commercial trade are 6 different kinds of goods: cloth, iron, wine, food, silk and salt. These goods are, as much as possible, acquired at a low price. They are then transported by wagon to another city where, if the market is properly managed, they will be sold for a considerable profit. And what do you want to do with all that money? Make a name for yourself by raising your social status. At the end of the game, the player who managed to make the most prestigious name for himself wins the game. 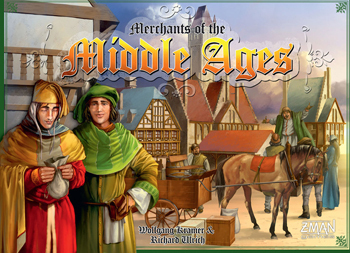 Merchants of the Middle Ages is played over several rounds, each round with action phases. In these phases, players will purchase goods from the cities on the board and store them in their warehouses, auction wagons for moving the goods, load goods onto the wagons, move the wagons toward other cities, alter the price of the goods and ultimately sell the goods when the wagons arrive at a destination. Along the way, players acquire investment cards that give them special abilities through various phases of the round, and influence cards for one-time bonuses. The whole purpose of buying and selling goods is to acquire money that players use to elevate their social status, for it is social status and not money that is the ultimate determinant of who is the greatest merchant. * The investment/special ability cards are no longer distributed/auctioned before the first round of the game; instead they are auctioned in phase 6 of each turn, where a limited number of them are available at one time. Nos gustaría tener aquí tu opinión. Opina y guarda "Merchants of the Middle Ages (INGLÉS)"